Stephen King has been without a doubt one of the most successful writers in the past 50 years, writing successful novel after successful novel to a wide amount of readers. In terms of film success, however, his work consists of a lot of hits and misses. Despite a good majority of his work being adapted into screenplays, the acclaim that they received varies greatly, from the masterpieces like The Green Mile, Misery and (believe it or not) The Shawshank Redemption, to hilariously bad films like Maximum Overdrive. IT, the story of a group of old friends reuniting in their hometown to take down an evil force that that they fought before as kids, lies in the middle of this list. Despite being more comprehensible to understand than the book at times, the movie goes on for quite a while, being made for TV rather than a theatrical release, and does suffer from a traditional observation in King’s stories: that certain things that seem scary on paper feel somewhat silly on screen (evil hedge monsters in The Shining miniseries anyone?). However, IT is still an enjoyable movie in certain places and has without a doubt the scariest evil clown ever seen by your tiny child mind: Pennywise. Played to creepy perfection by Tim Curry, this guy was the star highlight of the adaptation, bringing a disturbing yet hilarious charm to the town of Derry and introducing a lot of people not touched by the Joker to Coulrophobia. And now, like so many other adaptations and franchises of the past, IT is getting a reboot. But who could possibly replace Curry in such a role? That honor (maybe) goes to Swedish actor Bill Skarsgård , to which sources at Variety have assured is “top evil” to play the part of Pennywise. Originally, the part for Pennywise was going to be given to Will Poulter of the The Maze Runner films, but due to schedule conflicts was forced to turn down the part. 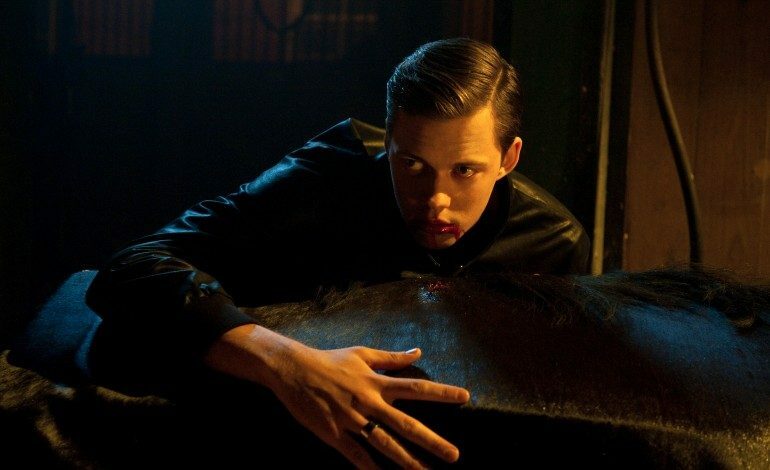 Having previously starred in European films like Simple Simon and Anna Karenina, Skarsgård got his debut to US viewers with his role as Roman Godfrey in the Netflix series Hemlock Grove before starring in this year’s The Divergent Series: Allegiant. While I’m assuming his role on the horror television series was what intrigued the studio, the rest of his roles may leave viewers skeptical in terms of casting. It certainly wouldn’t be the first time our doubts been proven wrong – consider the late Heath Ledger, who went from the pretty boy from A Knight’s Tale and 10 Things I Hate About You to be flat out terrifying in The Dark Knight. If anything, that performance has taught me never to judge a casting choice until you see the performance, otherwise you’re just basing assumptions off of minimal data and a lack of faith in the director/studio. However, there is something else that worries me about this movie: splitting it into two parts. Following Harry Potter and the Deathly Hallows, studios have used the idea of splitting movies into two parts as a means to tell more of the story than they usually could and, more importantly, make a lot of money out of it as well. In this case, IT will be split into two separate movie: the first showing the Loser Club as children fighting off Pennywise as children and the second showing them returning to Derry as adults to finish the job. This is very reminiscent of the 1990 TV miniseries and while I personally think the studio is intentionally using this storytelling tactic copy the previous adaptation rather than make a profit, it doesn’t really work all that well. The reason that the TV miniseries worked well with two parts, despite being three hours in length, was because it was MADE for TV, having one episode shown one day and the follow-up a few days later. By contrast, movie two-parters usually have six months to a full year in between releases, and unless they hook in the audience from the very start (ex. Harry Potter again), the long wait between films feels completely unnecessary. In other words, unless the studio releases both movies within a year or so, the marketing strategy might not be as good as they think. I appreciate the writer’s desire to tell the full story of IT, but unless the first entry is extremely compelling, they probably should just stick to another TV miniseries. Otherwise there’s a chance things might not flow as well as they hope it will.